Championship fights aren’t suppose to go down like that. Championship fights are supposed to be explosive things, full of drama and noise and fury and fireworks displays, with fighters knocking each other senseless for 25 minutes or diving for elaborate submissions or leaping off cage walls to kick each other in the head. Championship fights are supposed to be full of bangs and free of whimpers. And their ends—whether they come 30 seconds or five rounds in, without doubts or full of controversy—are supposed to be conclusive, at least in as much as everyone watching knows something’s concluded. 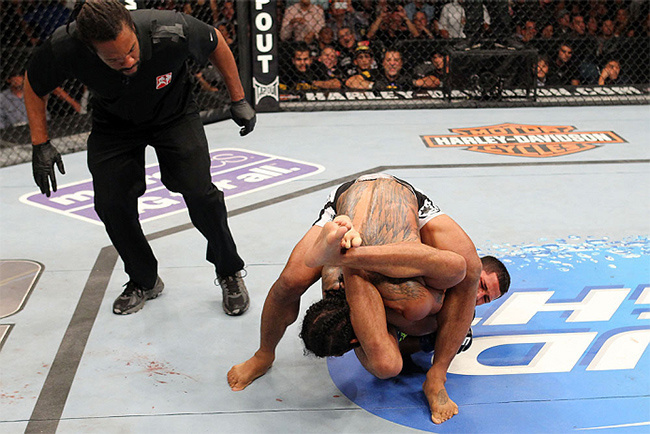 What we got this weekend at UFC 164 was something different. The fight between lightweight champion Benson Henderson and Anthony Pettis may have been the first title fight I’ve ever seen that ended quietly, almost peacefully. After all the build up following the men’s first fight three years ago, which essentially ended when Pettis flew sideways off the cage and threw a a head kick that might be (now and forever) the single most dramatic and iconic moment in MMA history, after all the drama and speculation about Henderson’s ability to shake off the ghost of that loss and about Pettis’ ability to finally live up to the expectations created by that victory, after all the tension and the years of exciting fights, it was right for us to expect explosions. What we got instead was something more subtle, vague, and mysterious, and for my money, something more interesting than another knock-down/drag-out five-round war or flash knockout. On its biggest stage we got to see mixed martial arts at its most intimate: A quick scoot of the hips, a subtle shift in pressure, a quiet admission, and an ending so elliptical and uncertain even the referee didn’t even realize it had happened. What more could you want from a giant pay-per-view spectacle? He assumes, anyway. There was actually no tap. Instead there was a quick word passed between two professional athletes fighting in front of 10,000 people and hundreds of thousands more watching at home. In the still of that arm bar attempt, with Pettis straining to flatten himself onto his belly and Henderson crouching down trying to relieve pressure, Henderson didn’t flail or wail. Replays showed he didn't even look like he was in much pain. He just knew. So he said, softly enough so only Pettis could hear, “Tap.” That was it. Just a word. Barely a word. Just a syllable, a sound. By the time Dean or the crowd even knew what was happening, Pettis was already sitting on top of the cage celebrating, and Henderson was shaking his head in disappointment. For a moment, the crowd at the Harris Bradley Center in Milwaukee--Pettis' hometown--was silent as the grave. A night that had begun in fireworks and blasting music had ended with a private dialogue. I can’t think of any other sport that would allow for that kind of intimacy, that kind of delicacy. It’s a wonderful irony about mixed martial arts that the toughest and most grueling, some would say most brutal and inhumane, sport in the world—filled with blood and broken bones, even bouts of unconsciousness—can end with a single word spoken so quietly no one else but one’s opponent can hear it. Championship basketball games or football games may be decided long before they’re through, but when the end comes it always comes accompanied by the sound of alarms and bells and whistles. You can give up but the clock marches on, rolling towards its inevitable and clear end. But mixed martial arts is vaguer and more interesting than all that; it's both the most violent and the most delicate of all sports--and often indifferent to the fanfare and manufactured drama of other sports. No one jumped off a cage last Saturday, sure, but Ben Henderson and Anthony Pettis did exactly what we expect our athletes to do: They communicated.